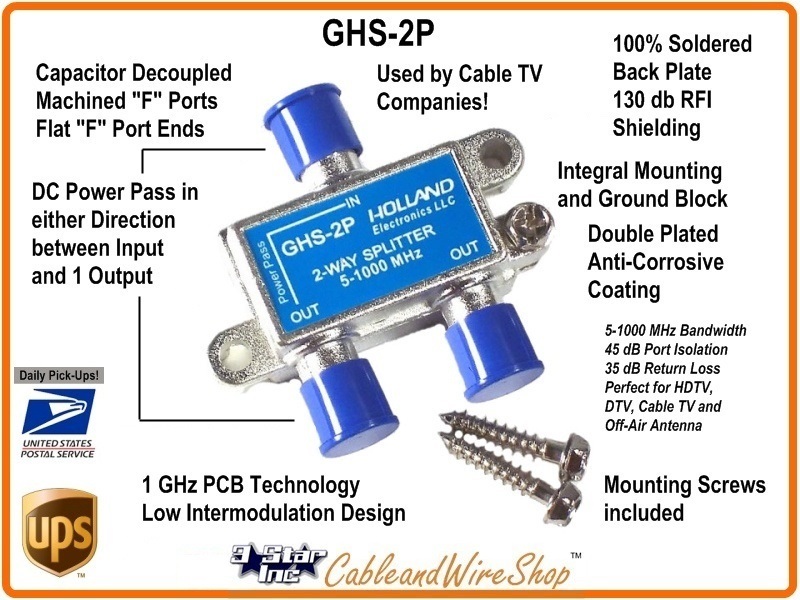 The GHS Series 1 GHz Splitter are state-of-the-art product lines designed and tested using the most current procedures. New performance features have been incorporated to make both series compatible with the latest digital and return path requirements. Low intermodulation design and optimized return band prevents high cable modem signals from affecting forward band transmission. The GHS-2P Series power passing to one port Splitter have been specifically designed to meet the highest electrical specifications. Careful isolation of the RF and DC path is required to prevent saturation or burn-out of the high permeability ferrite core. This has been accomplished using a separate DC bypass core material which can withstand higher impulse spikes before saturating. Note: There are plenty of Power Passing 2-Way Coaxial Cable Splitter on the Market, but This One passes Power only on 1 Leg only off the Split. That way, you can back-feed power upstream to the HDTV Antenna Pre-Amplifier or the Cable TV Inline Amplifier without sending Voltage throughout the entire system. Its Double Thick Plated Housing is Soldered Closed and Sealed from the Environment, as well as Transient and Spike Voltage Resistant. There's been plenty of chatter about this Product on Technical Blog Sites, this is where you get it. Get the Specifications by Clicking on the pdf Link above. It will pass Forward and Return signals; making it perfect for Splitting Cable TV with High-Speed Internet Connection Signals. The Voltage Protection also makes it suitable for splitting HD TV Antenna Signals as well. The Flat F Connector ends means that the connection to the RG coaxial cable you use (RG6 or RG11) is solid, secure and doesn't slip or back off after tightened with appropriate force (most Coaxial Cable Manufacturers specify in inch/pounds). When making RG6 or RG11 cable connections outside, a weather boot covering and some sort of Silicone compound are highly recommended. Product as Advertised, Fast Shipment, Very recommended seller!! !